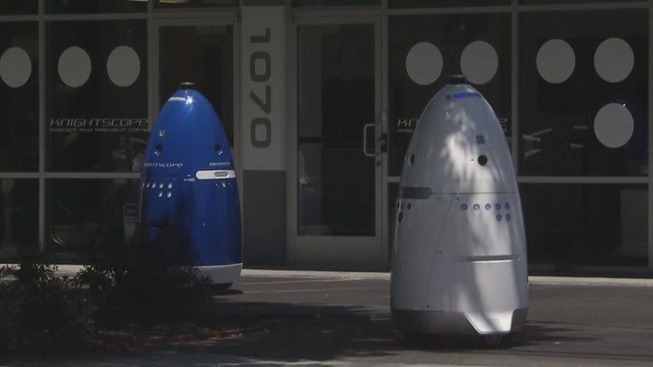 "The robot did not stop at all, kept moving forward and ran over his right foot"
A 16-month-old boy is recovering after a security robot apparently ran over his foot at the Stanford Shopping Center in Palo Alto, California. The boy's mother, Tiffany Teng, said her son, Harwin Cheng, was just a few inches in front of her when he bumped into the robot at the shopping center Thursday. Teng said her son fell down and the 300-pound robot ran over his foot. "The robot did not stop at all, kept moving forward and ran over his right foot," Teng said. "I started screaming." Teng said the robot was about to run over the boy's other foot when her husband pulled him away. Paramedics checked the boy and found swelling, but no broken bones. The robots have been used for about a year at the shopping center. They are created by Mountain View-based Knightscope. "This is a horrific accident, but we believe the technology and the machines are incredibly safe and we will continue to do our best to make sure that they are," said Stacy Dean Stephens, Knightscope vice president of marketing and sales. Stephens said Knightscope has machines operating all over California and have logged 35,000 hours with no incidents. The company is now investigating what may have gone wrong at the Stanford Shopping Center accident. Teng questions why the robot was roaming the mall without supervision if it was not able to detect a small child.